When you are driving and you see red and blue flashing lights, what do you think? Here in the Manila we often see red and blue flashing lights ahead, but we have given up looking for a police car. Here the most common use of red and blue flashing lights is to mark a U-turn slot in the road. These U-turn slots can be very interesting because it is very common to have three lanes u-turning at the same time. Throw in a bus and a dozen motorcycles into the fray and it gets very interesting. The other day I looked in my mirror and thought a U-turn slot was about to pass me on the left, but I was wrong. 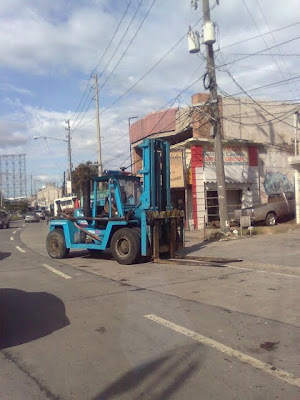 It was a police fork lift. If you look closely it has a police car flasher on the top. 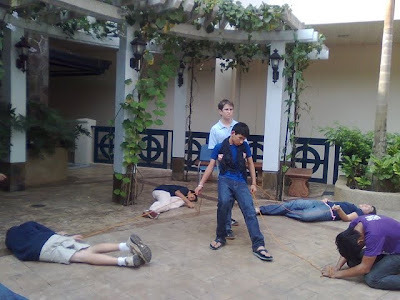 One of the things that Thomas has enjoyed at his school is the drama class. At the end of the semester he participated in a few different dramas. Carrie has been involved in all sorts of things. She and James were involved in a Sunday School ministry for children from a near by squatter village. She also has helped at a nearby orphanage. 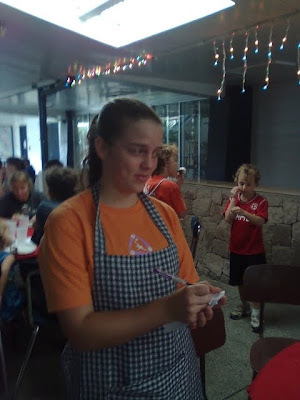 In this picture she was serving food for a class function. A couple of weeks ago I sent several chapters to our translation consultant for checking. I received her list of suggestions a couple of days ago and was very happy that there were very few corrections, considering the amount of the material and that the necessary corrections do not look difficult. 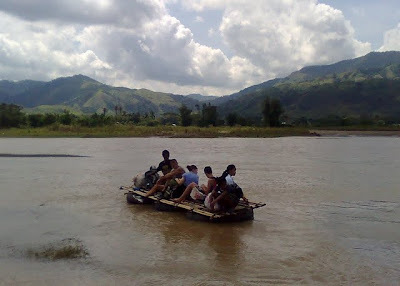 I am hoping for another trip to the village early in 2010 to do translation checking, Bible teaching, and distribute rice. 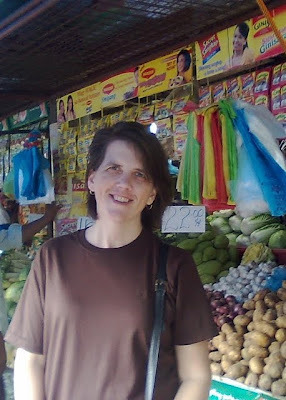 When we first came to the Philippines I taught in the school for the children of missionaries and Heidi took on the roll of supply buyer for several missionaries living out in the villages. Now that we are in town, Heidi is doing a bit of her supply buying job. We have one missionary family that is actually closer to Manila than they are to our northern support center, so we have been helping them out a bit. Last week Heidi purchased a food order for them and when school was out for Christmas, we took the order and two of their children who have been studying here in Manila to meet their father and hike into their tribe. The hike starts at the river. This picture was actually taken the last time we took the kids north to see their parents. This time the river was low enough to wade across, but not low enough for our van to drive across. We are enjoying getting to help people in many different ways.